I have a short story in the just published anthology The New Adventures of The Man In Purple, a Pro Se Press release under their Pulp Obscura imprint. For those unfamiliar with him, The Man In Purple is a Robin Hood like character from the 1920s originated by Johnston McCulley, famous for creating the legendary Zorro! 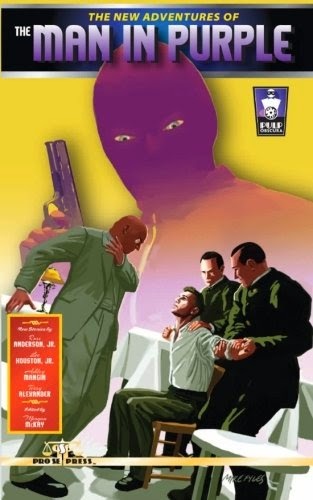 The disguise of a rich man named Richard Staegal and perceived as a crooked menace by the police, The Man In Purple actually robs from only the dishonest rich to assist the poor and needy. The four stories in this volume occur after all the original material collected by Altus Press in their 2010 anthology. Russ Anderson, Junior leads off with "The MEN In Purple", then my story has Staegal's alter ego "Captured! ", but not by his long time nemesis Detective Troman. Ashley Mangin has "The Man In Purple Take A Room", while Terry Alexander helps our hero face "The Doppleganger". Finally, "Paladins of the Purple Prose" gives you a brief introduction to all the creative people involved. In all honesty, I never knew The Man In Purple existed until this project arose on Pro Se's agenda, but Johnston McCulley was definitely ahead of his time with the concept, considering all the original material was published in 1921 issues of Detective Story Magazine, a good eight years before the infamous stock market crash of 1929 and long before the perceptions of today. Overall, I had a great time writing my contribution, and am more than willing to revisit the character if sales warrant a sequel volume. On behalf of the other writers and myself, we hope you enjoy The New Adventures of The Man In Purple, available in both print and e-book formats.